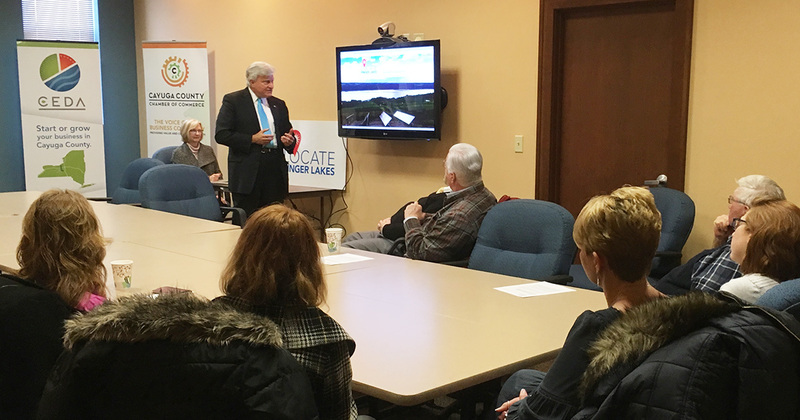 An initiative spearheaded by former state Sen. Michael Nozzolio is moving forward with plans to promote the Finger Lakes region with a focus on economic development. LOCATE Finger Lakes has created a website, locatefingerlakes.com, featuring links to county and state economic development agencies, local chambers of commerce and educational institutions in the region. Other information is available on the website, including details about job training services, where technology parks are located and research being conducted at colleges and universities. The website is one part of the LOCATE Finger Lakes’ digital footprint. Facebook and Twitter accounts are promoted at locatefingerlakes.com. The initiative’s Facebook page can be found at facebook.com/locatefingerlakes. Its Twitter handle is @LocateFLX. Nozzolio explained that the goal of the initiative and the newly launched website is to highlight the beauty and strengths of the Finger Lakes region. It’s not intended to compete with existing business development ventures. LOCATE Finger Lakes aims to collaborate with economic development agencies and other organizations. “We hope that this will be a resource that will be utilized with those other ongoing job development efforts,” he said. Nozzolio and Auburn businessman Jack Bisgrove, who is the founder of LOCATE Finger Lakes, first announced the business initiative last year. While much of the entity’s efforts weren’t known, Bisgrove and Nozzolio said it would seek to partner with other agencies and industries in the Finger Lakes region. There were challenges as LOCATE Finger Lakes formulated its mission. The Finger Lakes counties aren’t in the same state economic development regional councils. Cayuga, for example, is in the Central New York Regional Economic Development Council. Tompkins County is part of the Southern Tier council. The Finger Lakes economic panel consists of Ontario, Seneca and other counties traditionally associated with the Finger Lakes region. Because the regional councils are “artificially created” by New York state government, Nozzolio said, it doesn’t allow the Finger Lakes to tell its complete story. But LOCATE Finger Lakes’ focus isn’t solely on business development. Through its work, the initiative also wants to highlight the region as a great place to live. “What we need to encourage is for people to think of themselves as a Finger Laker and get the Lakers together as a unit because it’s certainly more strength in the promotion of our region together,” Nozzolio said. LOCATE Finger Lakes will roll out more elements of its strategy over the next 90 days, according to Nozzolio. One priority for the organization is to establish a forum for economic developers. There is also a plan for a program to encourage students in the Finger Lakes region to launch their own businesses. The institute will have a publishing component. The plan is to highlight business innovators in the Finger Lakes region, Nozzolio said. The stories will be published on locatefingerlakes.com. “I hope to share the enthusiasm that I have for our region with others and help promote the best aspects of our region,” he said.